The Front Page - TWC 2016 MODDING AWARDS: NOMINATIONS OPEN! TWC 2016 MODDING AWARDS: VOTING OPEN! The 2016 Modding Awards have now entered the Voting Phase! Polls will be open until May the 31st, so don't lose the chance to vote for your favorite Mods and Modders today! There was a time when the land was dark and the Modding Awards were always late, but this is not that time anymore! It's with immense pleasure that the Modding Awards Commitee is informing the fellow TWCenteres and our appreciated guests alike that the 2016 Modding Awards are now live! As first thing, we'd like to apologize for the little delay with which we have started these Awards; we told that we would have gone live with them by the beginning of February '17, but originally the plan was to go with the same procedure per last Awards (2015), is to say without providing any list of eligible mods, while eventually the Commitee decided to switch back to the old system, that, if from one side is making the nominations of mods and modders much easier, from the other has requested much more work and time to the Commitee. 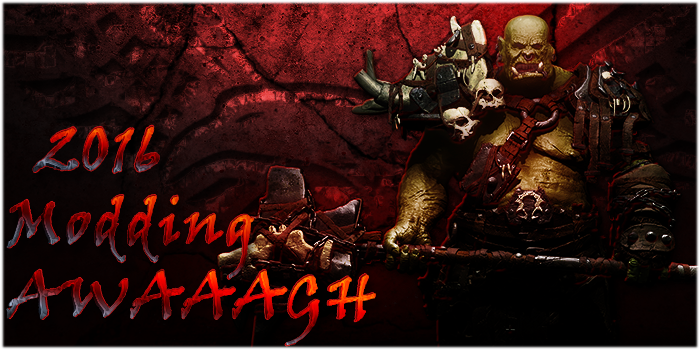 However, all's well that ends well, and therefore, welcome to the 2016 Modding Awards, or, as we in the Commitee like to call them, the 2016 Modding Awaaagh! The reference is quite obvious, considering that 2016 is the year of the release of Total War: Warhammer, the first title ever of the TW series to go into the Fantasy. The welcoming and success of this new title is debatable, none the less our beloved Modders haven't been idle and the quantity of Mods provided is really something, considering that the game has been available since only few months. We expect Warhammer to play an important role in these awards, as it did in the gaming scene during 2016 (if you are looking for more info about it, feel free to read the Review made by the Eagle Standard) and there will certainly be a thight competition for mods and modders to be awarded. 2016 Modding Awards medals, courtesy of Lifthrasir. Anyways, Warhammer isn't actually the only news of these Awards, as the Commitee has worked hard to provide some new categories and to update rules and to make them fairer. On the side of categories, for the first year we have introduced what will be know as the "Classical Mod" award: every title except Attila and Warhammer will have two special categories, which goal is that of awarding those evergreen Mods that have earned the appreciation of players throughout the years; it is important to notice that only Mods that have not been updated significally during 2016 will be eligible for this category. Along with these new awards, we are also introducing a special "Resource Award", which is aimed at rewarding those tools/guides/resources that are released and are actually available to the membership. The Award is divided into two distinct categories: resources released pre-Warscape and after-Warscape, and therefore there will be the TW2 Engine Recource Award and the Warscape Engine Resource Award. We'd also like to point your attention to few important news for what concerns rules: it has always been customary to not to disclose who you voted for in the voting polls, but the rule wasn't yet official and it caused some troubles in the past, hence we have now added it to the Official Rules; similarly, while promoting the Awards as a whole is accepted (and encouraged), explicitly asking for votes it isn't, and even if this will not automatically lead to a disqualification of any nomination, this will likely be the case; in any case, the Commitee reserve the right to decide on this matter. Once again, we'd like to remember everyone that the Commitee that runs the Award is entirely based on voluntary participation, and that there wouldn't be any Awards if not for the commitment of those who are part of it; similarly, the success of the Awards depends not only on what we in the Commitee do, but also on how the community helps to advertise them and in the way each of you participate in them; as one who has been at the head of the Eagle Standard for more than three years and hence have had the opportunity to review many Mods and to chat with many Modders, I can safely say that recognition comes in many form, the first of which is the simple fact that the community you are contributing to is actively giving you the opportunity of being put forward. For this very reason, we kindly ask you to help spread the world around, also by using the 2016 MA Signature bar below. Simply copy/paste the code in the box below in your signature, it will be much appreciated! Finally, here's our Commitee for this edition. As usual feel free to show them your appreciation by repping them with great rep! Stay tuned for more info, we will take care of informing you about when the nomination period will end and the voting one will start! Appreciate all the effort, you guys deserve all the rep I can give.